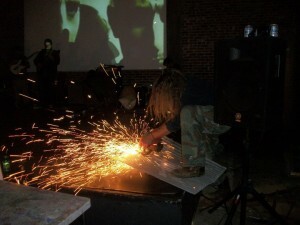 I’m hearing great things about the video shot by Thad Lee at Vox’s noise show earlier this month at the Powerhouse. The pictures I saw the next day made me hate that I had missed it. I think it was on a Monday or Tuesday, and I do my best to stay at home early in the week, believe it or not, what with the economy and all (i.e. my checking account). I should be posting that video here soon, but until then lets enjoy a pic and the fact that poets and musicians and welders can all have a good time in Oxford. This Tuesday, Vox returns to the Powerhouse with the dynamic duo of Neil White and Louis Bourgeois presenting their memoirs. Music by the Yodeling Anarcho-Syndacalists. Red beans and rice and wine from West Jackson Wine and Spirits will be consumed. As always, this VOX event is free. Food and wine for small donation. Sounds like a nice Tuesday evening to me.